Chicken cheese steaks are an alternative to beef-based cheese steaks, offering a different flavor and texture as well as different nutritional value. This type of sandwich serves up good-quality protein, vitamins and minerals, but it is high in sodium and fat -- although less fat than a beef-based steak. Despite this, it may still be an option in a healthy diet. 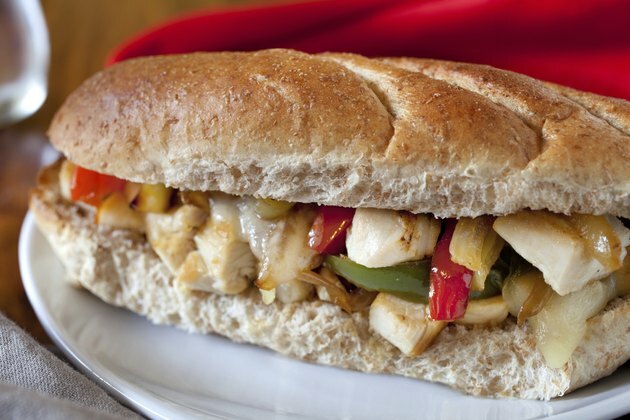 One brand of chicken cheese steak on a 6-inch roll with onions -- a common preparation -- contains 450 calories. If you follow a 2,000 calorie diet, a chicken cheese steak provides 22.5 percent of the calories you may consume each day. While men can generally eat between 400 and 600 calories per meal, women usually need less than this -- 300 to 500 calories. This makes a chicken cheese steak of this size too large of a meal if you are a woman eating at the lower end of this scale. Consider consuming a smaller portion or skipping the cheese to help lower the calories. A chicken cheese steak contains 15 grams of fat. Some people opt to consume this type of cheese steak over a classic cheese steak made of beef to decrease the amount of fat in their diets, but this dish still contains quite a bit of this macronutrient. When adhering to a 2,000 calorie diet, you should aim to ingest 20 to 35 percent of your calories from fat, or 44 to 78 calories. One sandwich has 52 milligrams of cholesterol; you should endeavor to take in 300 milligrams or less of dietary cholesterol daily. Eat a chicken cheese steak and you consume 45 grams of carbohydrates. This accounts for 13.8 to 20 percent of the amount necessary in your diet. One sandwich satisfies the majority of your daily protein needs, containing 34.3 gra,s; you need 46 to 56 grams of protein. The protein and carbs in this dish keep your energy levels up. Chicken cheese steaks are a good source of vitamin C. Each serving -- a 6-inch sandwich -- provides 49 percent of the daily recommended intake, which makes this dish useful for invigorating your immune system. Additionally, you take in 24 percent of the calcium you need each day. The calcium in a cheese steak helps to keep your bones intact, protecting you from breaks and deterioration. One serving also has 10 percent of the suggested consumption for iron. One chicken cheese steak is quite high in sodium, using up over two-thirds of the amount you should limit yourself to each day. The 1,116 milligrams of sodium in a sandwich can result in swelling in your limbs that occurs when water collects under your skin, but if you monitor your salt intake throughout the day or only consume a chicken cheese steak as an occasional treat, your health should not suffer.